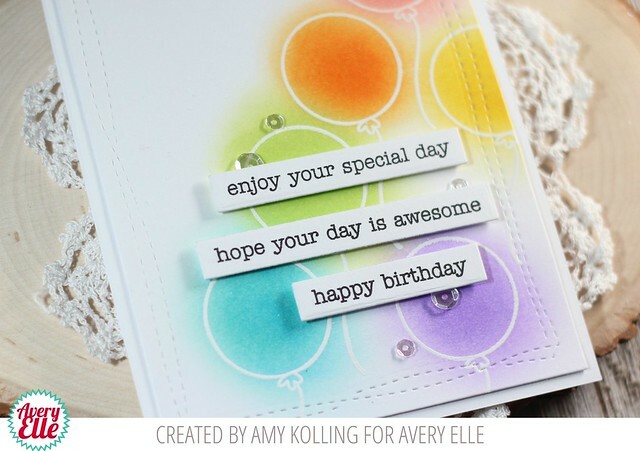 I know it's Christmas but I have a birthday card to share using one of the very versatile (and must have) stamps sets.......Simple Sentiments from Avery Elle. 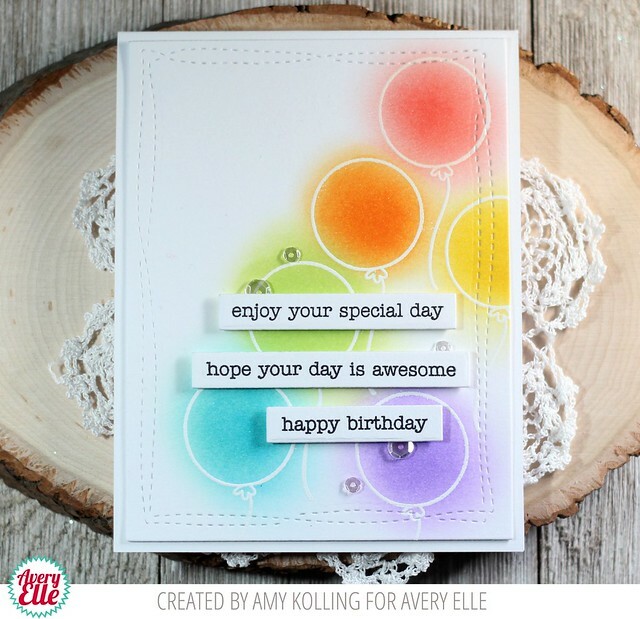 I had the idea to white heat emboss the balloon from Party Pals so I could add color inside. I did this by using some beauty brushes, Distress Inks, and a very light touch. Of course, I did them in rainbow color. After blending the colors, I buffed the balloons with a paper towel. The balloon panel was die cut using the Wonky Stitches Elle-ments. For the sentiment, I used several sentiments stamped onto Simple Sentiments Elle-ments. I added them with foam adhesive at varying heights. As a finishing touch, a few clear sequins were added in. Hello! 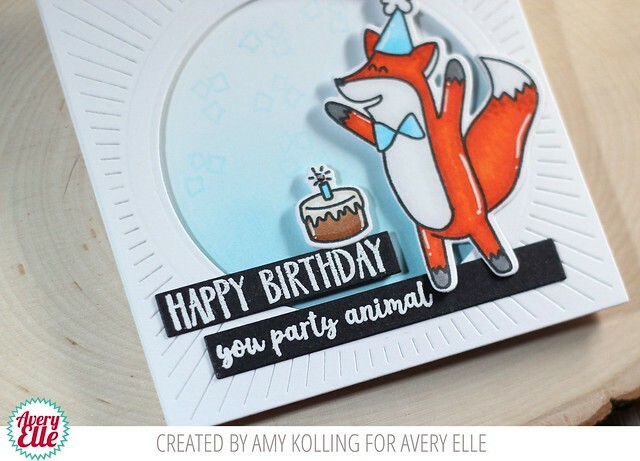 I'm here to party with you and this adorable fox from Party Fox! I am always in need of masculine birthday cards and this set is perfect! I colored my fox in with traditional colors and added a blue party hat and bow tie. 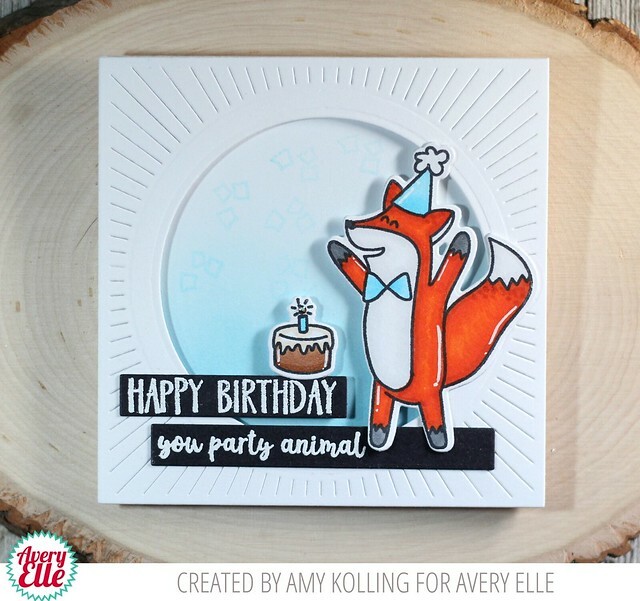 The images were die cut with the coordinating Party Fox Elle-ments. I added my fox to a Tumbled Glass ink blended background and surrounded it with the Burst Elle-ments. I stamped some confetti in the same Tumbled Glass. To finish, I added white heat embossed sentiments onto black sentiment strips from Simple Sentiments Elle-ments. Hello! 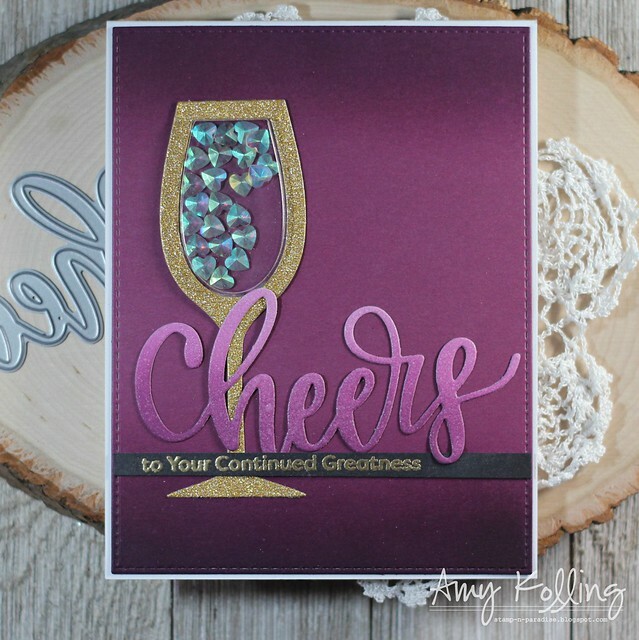 I have a fun card to share using the newest My Favorite Things Card Kit called Good Time to Wine. It includes papers, wine glass shaker kit and pouches, and a wine sentiment set!! I started with a Pure Plum Cardstock panel from MFT (I don't think this color is available any longer) that was die cut using a Stitched Rectangle Die-namic. To the top and bottom, Distress Inks in Seedless Preserves and Dusty Concord were ink blended with the amazing beauty brushes (See below to order yours!). I created my shaker using gold glitter paper and filled it with heart gems from Studio Katia. They were perfect as they pick up colors from around them. 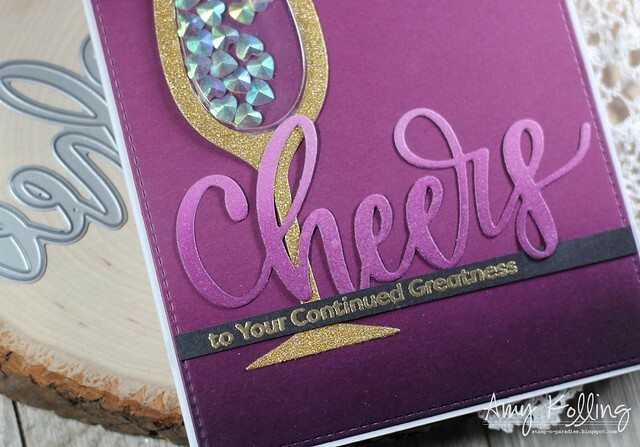 For the sentiment, I added an ink blended "Cheers" die cut (free with $60 purchase) and spritzed with lots of sheer shimmer spray. To finish, I gold heat embossed a partial sentiment from Good Time to Wine stamp set onto black cardstock. Remember to go pick up your own Good Time to Wine Card Kit! Here are the BEAUTY BRUSHES. They are the BOMB! Click on the picture to shop! 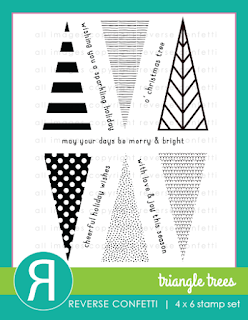 Welcome to Day 2 of the Lil' Inker Designs December Release! This release is FULL of amazing dies and stamps for WINTER......are you ready? Guess what?? The whole new release is now available and can be found HERE!!! How fun are these cute penguins from Good Cheer? I've paired them with a fun color combo onto a white on white background using the new Buffalo Plaid Cover Up Die. My sentiment was stamped onto a pink cardstock strip and a few navy gems were added to add some shine! 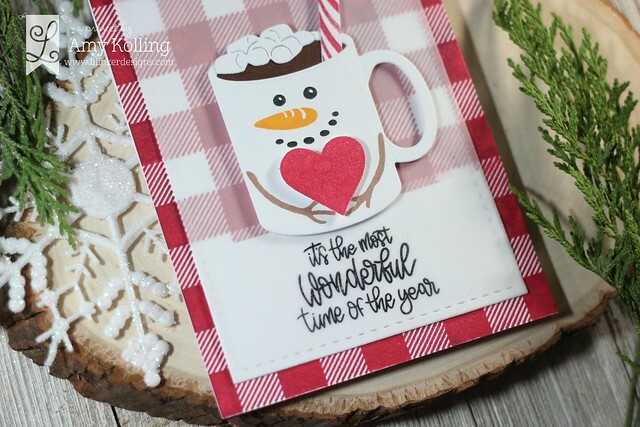 Using more of the Cozy Plaid and Comfy Cocoa set (along with the Coffee Talk 2 Die Set) for a wintery "HUGS" card! 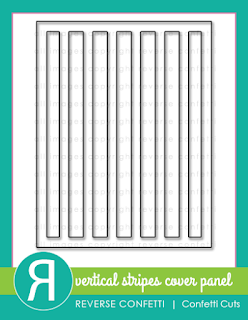 This plaid background was stamped with black ink onto aqua cardstock. 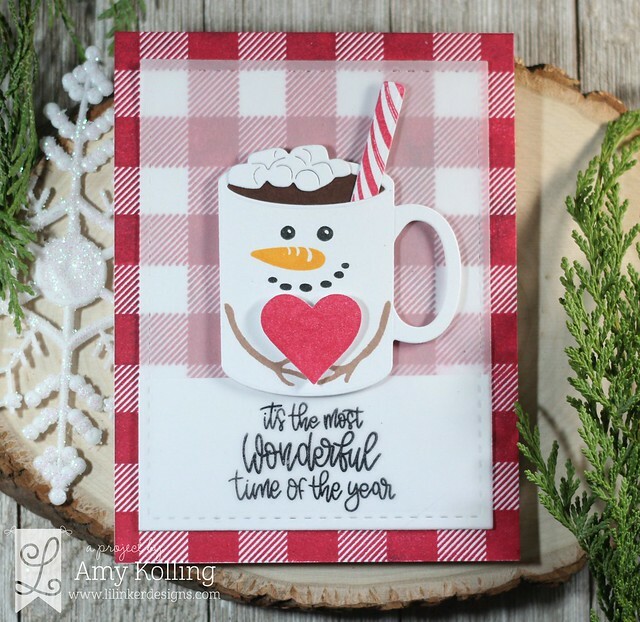 To kee this simple, my mug was cut from the same color of carstock and stamped using the snowflake image from Comfy Cocoa. My mug was layered onto a Stitched Mats: Rectangles in black cardstock. 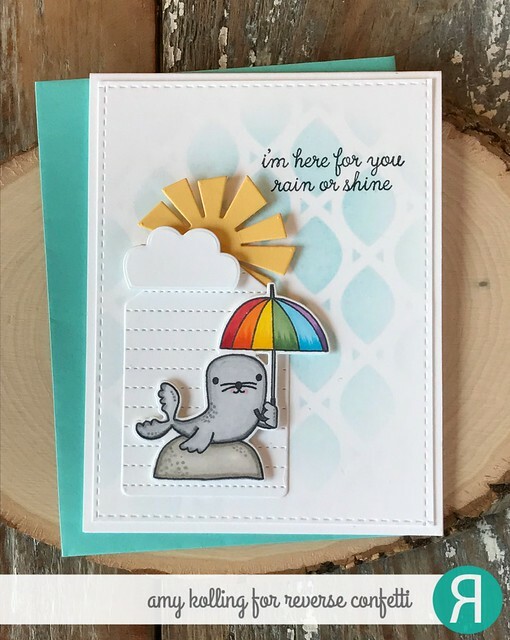 My 'hugs' sentiment was stamped in black, die cut, and layered onto a white shadow. I added a white glittered Stitched Snowflake Die and some gems. 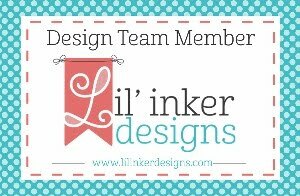 Welcome to Day 1 of the Lil' Inker Designs December Release! This release is FULL of amazing dies and stamps for WINTER......are you ready? Guess what?? The whole new release is now available and can be found HERE!!! I had to start things off with the AMAZING background stamp set called Cozy Plaid. The possibilities with this set are ENDLESS! I hope you follow me over on Instagram because I shared a fun photo of all my backgrounds I created using this stamp! I did this background with Glamorous VersaFine Clair ink onto white cardstock. I layered a Stitched Rectangles vellum panel over the top. I created a cute snowman mug full of hot chocolate! Using the stamps from Comfy Cocoa, I stamped my snowman and have it holding a heart. I embellished the mug with some extras (candy cane and marshmallows) from the new die, Comfy Cocoa. I love this scripty sentiment stamped onto the vellum! Hello! I am sharing a card for the Reverse Confetti.......Stock Your Stash Challenge! Every month will be a new theme and this month we are showcasing Thank You! 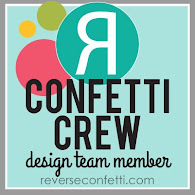 Shop for Reverse Confetti HERE! With the holidays upon us, I knew I would need some thank you's. Yes I know, this is full spring and color. Go figure. My favorite times of the year have COLOR! I started with a panel cut with the Small Diamond Tiles Cover Panel out of white cardstock and adhered it to a white notecard. Using Tumbled Glass Distress Ink, the ink was blended using the brushes I mentioned on IG and my blog the other day. (See my post from Dec. 8) They blend color AMAZING! My florals are from the Banner in Bloom set and were colored with Copics. I added my bloom with foam adhesive and some white gems. 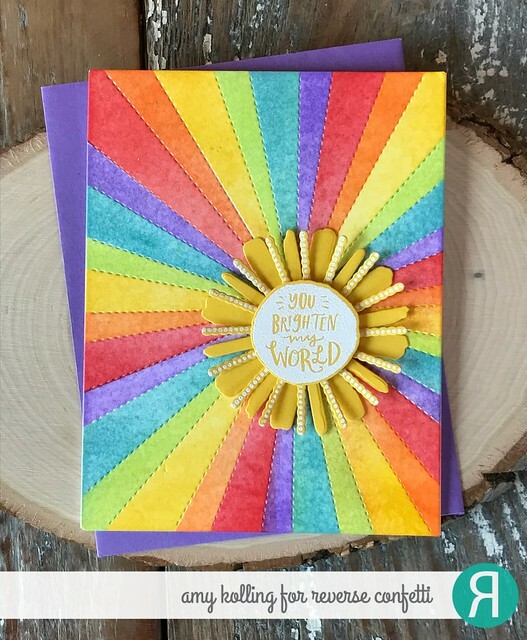 Visit the Reverse Confetti blog for all the details on the Stock Your Stash Challenge! Welcome to the Reverse Confetti December Blog Hop! Make sure to check out the Reverse Confetti blog for all the details of this hop and for a full list of inspiration and information. This month our theme is "A year to remember" along with a few of our past favorite Reverse Confetti projects. Check out the latest RELEASE.........HERE! I recently went to Vintage Market Days and saw LOTS of fun displays of bottle brush trees. Gave me lots of ideas for those trees I've been "collecting"! I wanted to recreate some of those pink ombre trees I saw! I began by ink blending with THESE BRUSHES. They are the BOMB! 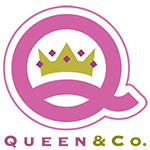 Click on the picture to shop! Using these brushes, I ink blended Worn Lipstick Distress Ink onto a white panel of cardstock in ombre fashion and blended the same ink onto a white notecard. 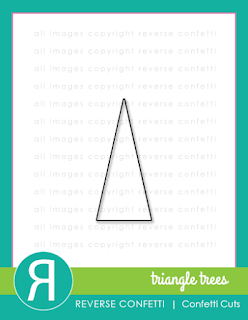 From the ink blended panel, four Triangle Trees were die cut in opposite directions. To each tree, I overstamped them with the stripes from Triangle Trees stamps and colored each line with a glitter gel pen. 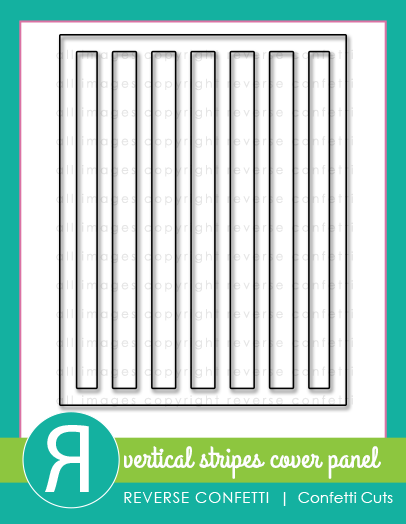 The trees were layered over a Vertical Stripes Cover Panel onto the white ink blended notecard. A simple sentiment strip was added with foam adhesive along with some silver gems. Here are some of my favorite past Reverse Confetti projects from this year!